Part of the advance in life expectancy is that we have technologically inhibited the ultimate event. We have fought natural causes to almost a draw. If you eliminate smokers, drinkers, other substance abusers, the obese, and the fatally ill, you are left with a rapidly growing demographic segment peculiarly resistant to death’s appointment—though far, far, far from healthy. These are the words of Michael Wolff written in a cover story published in this week's New York Magazine. Even though there are some things I take issue with in this piece, the depth and honesty in his story moved me to want to write about it here. Wolff's story revolves around his mothers diagnosis of Alzheimer's disease and the years of cognitive and functional decline caused by this slowly progressive neurodegenerative disorder. 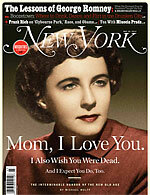 The course of her disease was marked by hospitalizations, major heart surgery for aortic stenosis, and what Wolff describes as a "series of stops, of way stations, of signposts" in which she goes from being at home, to needing assisted living, to needing nursing home care, to being at home with hospice. And yet, I will tell you, what I feel most intensely when I sit by my mother’s bed is a crushing sense of guilt for keeping her alive. Who can accept such suffering—who can so conscientiously facilitate it? The one aspect that I take some objection to is the one-sided and very negative view of disability in late life. He equates the "drawn-out, stoic, and heroic long good-bye" to "human carnage", and backs this up with studies showing that 70% of those older than 80 have a chronic disability with over half having at least one severe disability. However, at least one study by GeriPal's Alex Smith shows that it is possible to be significantly disabled and dependent on others for help with even basic activities of daily living, and yet also have a good self-rated quality of life. With that said, I still think this is truly a remarkable read. As one columnist said: "force yourself to get through "A Life Worth Ending"... not because it's a bad piece. It's beautifully written and evocative — it's just that it's almost too evocative for anyone who has ever watched a loved one die slowly from illness." I agree this is a very well done essay, and a nice companion piece (for teaching purposes especially) to Katy Butler's lovely "What Broke My Father's Heart." As a society, we seem to ignore what being old is actually like for most, preferring to focus on images of our aging celebrities rather than our aging relatives (and selves). I too object to a couple of things about this essay, though. He seems to imply the way to address the suffering of progressive disability is to allow physician-assisted suicide or some other "do-it-yourself exit strategy." This is an understandable but not very well-considered conclusion. Perhaps the reason Wolff thinks so is because the option of palliative care was so poorly represented: 1)The conversations he relates with his mother's care teams do not resemble what geripal readers will recognize as effective communication. 2) He's told during a meeting about the care of his clearly delirious mother, "the levels of medication that the agitation might respond to could depress her breathing," an option the physician was not comfortable exercising. No doubt this demented and delirious patient was being given a benzodiazepine, and 3)He's told by a geriatrician that palliative care "can ease her suffering, but the side effect can be to depress her functions." This after she has far outlived her prognosis while receiving hospice care. Whatever happened to allowing what's most important to patients and families determine the care that we provide? I appreciate any in-depth articles on how we live and die in all of its complexity and messiness. However, I cringed over the use of the term "quality of life." Wolff seems to be using it as a euphemism for "we don't want more medical treatment, can't you see she's suffering and we need help?" Clearly, discussing dying and end-of-life care, especially when slow and drawn out, is difficult. 2) Quality of life is NOT a euphemism for "we can't do more medical treatments and you're going to die now." Quality of life can be addressed and aimed for throughout illness, culminating in a quality death.